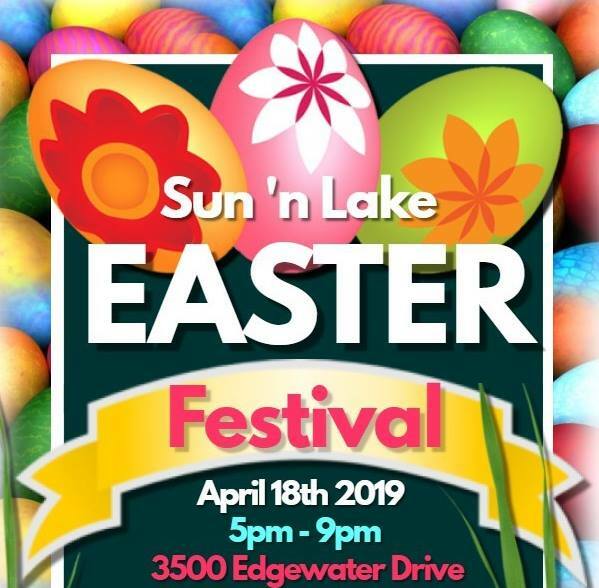 Join us at the Sun 'n Lake Community Center for the 2019 Easter Festival! This year will feature Gourmet Truck Expo food trucks, an inflatable obstacle course, face painting, bubble dance party, a photo opportunity with the Easter Bunny, and more! Don't forget to sign your child up for the Easter Egg Hunt! There are over 12,000 eggs filled with candy, stickers, and small toys to help celebrate the Easter season! Space in each category will be limited to the first 100 registrants, and all egg hunters must be pre-registered. To register your child for the Easter Egg Hunt, please call Marie Soto at (863) 382-3679, email msoto@snldistrict.org, or visit the SNL Recreation Center.